Participate in the new Kingdoms Battle: Fury global Competition involving 4 opponent Kingdoms. Over 2 days, complete tasks and earn points to bring your Kingdom to victory. 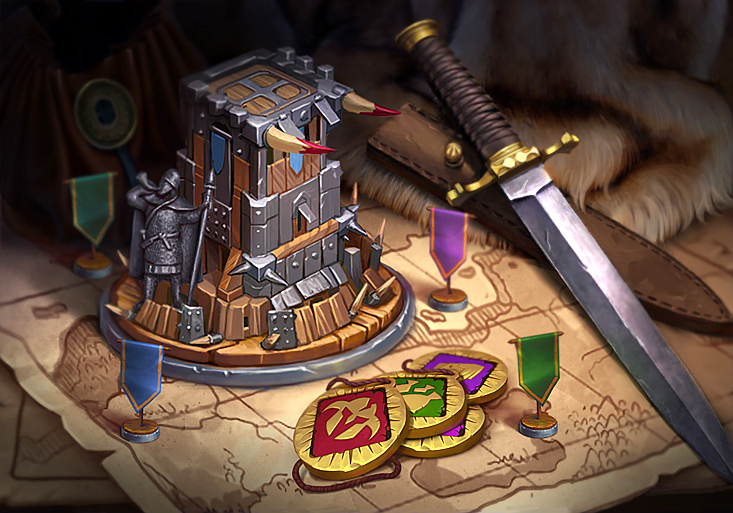 If you manage to capture a special Fortress – a Tower of Fury – you'll receive a generous reward: resources, Soul Shards, and points in the Competition. Temporary bonuses that increase the number of points for certain tasks will also be active in the Kingdoms. Passing new legendary checkpoints in the Competition will bring you extra rewards for personal and Clan achievements. Go for it! A branch for upgrading troop health has been added to the Valkyries' Citadel. Strengthen morale and help your warriors to achieve incredible levels of endurance! Now you can send coordinates right from a location window on the Global Map. To do that, hit the special button with an arrow on it. Please note: сoordinates from Kingdoms automatically have the Kingdom number attached and coordinates from Jotunheim show the world name. The Watchtower has always promptly informed you about attacks on your Town and allowed you to search for objects on the Global Map. Now its functionality is even cooler: from level 17 of the Watchtower, the Navigator allows you to find out the combat stats of enemy warriors. The interface of the Favorites section in the Boosts window has been improved. All boosts are displayed in the order in which they were added, and the order doesn't change after activation. You'll also be able to see whether the boost is activated and the status of your Aes (summoned or recovering). Contact support with any question you have without leaving the game. To do that, hit the "Contact support" button in the Help section of the Menu. Fearless Jarl, are you ready for new confrontations? Then to battle! We have reworked the balance of the Shaman's bonuses in Onslaughts and battles for Fortresses. Fearless Jarl, are you ready for new confrontations? Then to battle!